Apartments are bigger than most in Kopaonik. Super friendly stuff! Price/value is great in March. Apartment is bigger than most of apartments I've visited in Kopaonik. Breakfast is much better than rating it got on Booking. They have free transport to ski center but you have to make a reservation and you get you seat for exact time both ways. Didn't know about it, so missed to make a reservation. Very friendly hosts. Every day free transfer to the ski center.regardless of the weather. The studio, it was big, clean and well equipped. Ski bus available. No need to go by car to the slopes. Friendly staff at the reception, very responsive. They've changed our room immediately once they saw the living room beds were not good. They've also fixed our heating system when it ran out of pressure. Breakfast buffe was good. Restaurant facility is very cosy. Staff was friendly. Dinner a-la-cart was very good (they serve buffe dinner too). Rooms are spacious enough and clean. Balcony offers a nice view on the mountain. 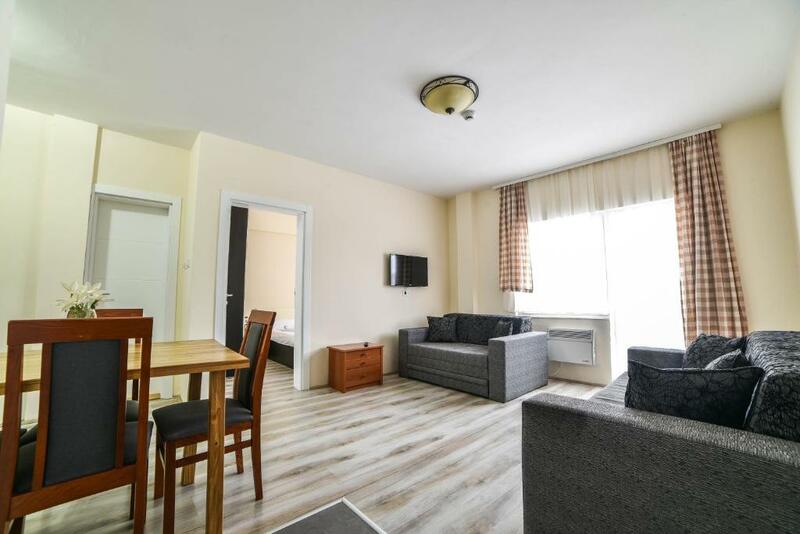 Large and well equipped apartment. Very clean, cosy and furnished in mountain style which made our stay even more nice than usually. Staff was super friendly and polite. If you need something you can simply call the reception desk and you will get support in less than 10 minutes. Breakfast offers anything you can imagine from domestic Serbian food and the offer includes beautiful view. Parking is available on site and is just in front of apartment. There is ski bus operating from apartments village directly to the ski slopes. Very spacious apartment! Great breakfast for anyone’s taste. Both traditional dishes and modern. Staff was very helpful and responded promptly to our requests! Really nice view and the apartments were clean. Parking is available for free at the property. Lock in a great price for JollyKop Apartments – rated 8.6 by recent guests! 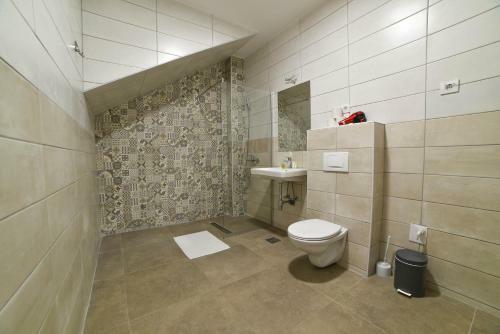 JollyKop Apartments This rating is a reflection of how the property compares to the industry standard when it comes to price, facilities and services available. It's based on a self-evaluation by the property. Use this rating to help choose your stay! 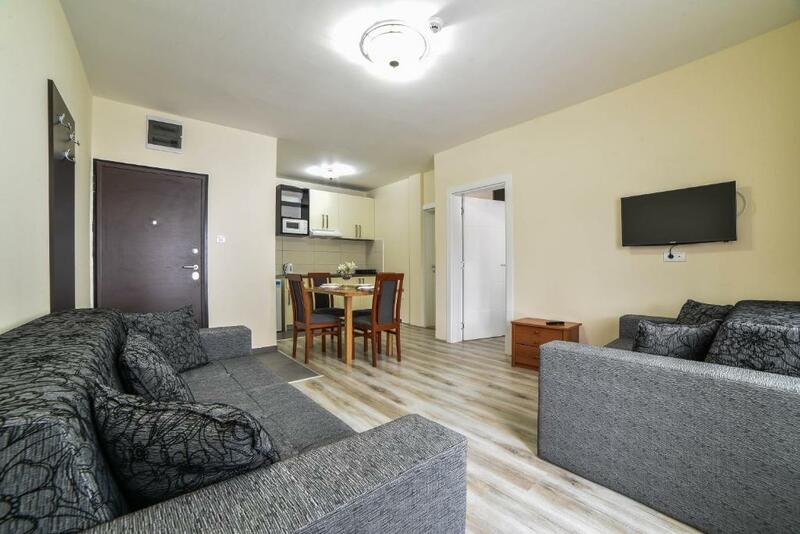 One of our top picks in Kopaonik.JollyKop Apartments is a mountain complex which includes a restaurant and offers apartments and studios set on the Kopaonik Mountain, 4,429 feet above sea level. Free WiFi is available and free parking is provided. Each unit has a well-equipped kitchen which includes various cooking utensils and serving dishes. The open-plan kitchen joins up with a comfortable four-seater dining area. All apartments have a living area which is fitted with a sofa and TV. Contemporary Serbian cuisine is served at the large restaurant, which features a playroom for children of different ages. Entertainment staff and babysitters are there to take care of the young ones. Kopaonik Ski Area has 24 cable cars and 43 mi of slopes. The national park is at a distance of 1.2 mi from the JollyKop. A local bus line with links to Kopaonik Ski Center and back operates hourly and is available at a surcharge. When would you like to stay at JollyKop Apartments? This studio comes with an equipped kitchenette and TV. A seating and dining area are provided as well. This apartment has an equipped kitchenette and TV. A sitting and dining area are provided as well. This larger studio comes with a separate sleeping area, an equipped kitchenette and a TV. A seating and dining area are provided as well. Featuring a terrace or a balcony that overlooks the mountains, this apartment comes with an equipped kitchenette and a TV. A seating and dining area are provides as well. This apartment features a private entrance, sauna and kitchenware. Apartmansko naselje JollyKop nudi komforne, moderno opremljene i kompletno funkcionalne studie i apartmane sa najlepšim pogledom na Kopaoniku. 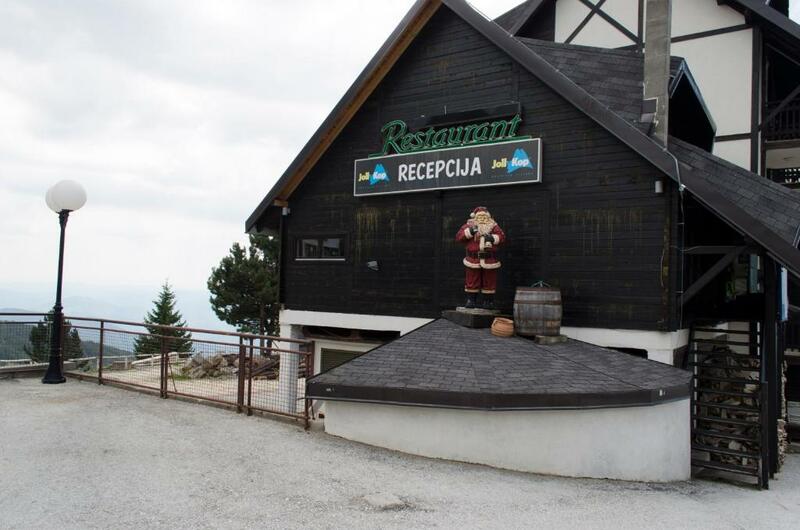 A la carte restoran specifičnog enterijera, koji se nalazi se u okviru naselja, pruža mogućnost doručka na bazi švedskog stola ali i ukusna lokalna, tradicionalna srpska i internacionalna jela. Besplatan prevoz do skijališta, prostoran parking, wifi internet, igraonica i prateći sadržaji za najmlađe goste pružaju idealnu mogućnost odmora za porodice tokom letnje i zimske sezone. Kopaonik je najveći planinski masiv Srbije i jedan od najlepših ski centara ovog dela Evrope, udaljen 290 km od Beograda. Skijaški centar Kopaonik prostire se na oko 62 km staza i ski puteva uređenih za alpsko i nordijsko skijanje. U okviru ski centra postoje 24 žičare i ski lifta sa ukupnim kapacitetom od 32.000 skijaša na čas. Sistemom za veštačko osnežavanje pokriveno je 97 % skijališta što sezonu skijanja produžuje do meseca maja. Kopaonik poseduje tri staze po FIS standardima za slalom i veleslalom ali i 20 km (rute 3 km, 5 km i 10 km) uređenih staza za nordijsko skijanje. U okviru skijaškog centra nalazi se snowboard park, osvetljena staza za noćno skijanje, ski i snowboard škole za decu i odrasle ali i niz drugih sadržaja poput: igraonica za decu, ski vrtića sa pokretnom trakom, snow park u kome se organizuju mnoga takmičenja domaćeg i međunarodnog karaktera. House Rules JollyKop Apartments takes special requests – add in the next step! JollyKop Apartments accepts these cards and reserves the right to temporarily hold an amount prior to arrival. Please inform JollyKop Apartments of your expected arrival time in advance. You can use the Special Requests box when booking, or contact the property directly using the contact details in your confirmation. Very friendly welcome and stuff. The breakfast is so nice here, which is included in the price. The panoramic view is nice as well, from the room and from the restaurant. Daily shuttle bus from the apartment to Kopanonik Ski center. No matter that it is 8kms away, because you can use the bus, free. Very nice accomodation. Distance between Jollykop Village and Kopaonik ski resort is in fact 7-8 km. Jollykop has 2 buses with which they facilitate the acces to the slopes. The receptionists was kind to let us make a late check-out due to the fact they did mot have a reservation for that particular apartament. We apreciate that because our child had fever. Thank you ! Internet was not great and has a limited number of devices, which is poor for a room that houses multiple people. Nice and simple accommodation. Booked 1 bedroom apartments which can comfortably sleep 4 the way they are arranged. Good breakfast. Good parking area. All in all no issues. About a 10min daily drive to the ski centre. Parking access could be better. Bad sheets could be renewed. Breakfast starts in 7.30. 30 minutes earlier would be more comfortable for people who wants to avoid traffic to ski center and be there at opening. Not good informations about lockal transport ! Best dinners service in lockal restorant ! There were some little things (mainly related to the infrastructural maintenance) that we would recommend the management to take care of, such as leaking shower, loose sink, some damages of the furniture, etc. Spacious apartment, nicely furnished. The heating was excellent. The breakfast was very rich! We have also enjoyed delicious meals at the same restaurant, beside breakfast. Very convenient SKI bus arrangment, FOC for Jolly's guests. Very friendly and servile staff. My apartment was very close to the roof so I heard many pigeons during the night and couldn't really sleep well.